Most swimmers are well aware of the need to prepare properly before any race. However, this doesn’t mean you won’t suffer from some pre-race anxiety. In fact, this is fairly common in the swimming world. You’ve invested a lot in your practice swimsuits and racing swimsuits and now it’s your time to shine. The following tips will help you deal with some of that anxiety so you can focus on performing your best. Practice swimwear is just some of what you need. Writing isn’t a strong suit for everyone, but it doesn’t have to be in order to be effective. If you are able to write about your feelings regarding your next race, chances are you will be able to work through them more easily. It’s easy to eat, sleep and breathe swimming when it’s something you love, but this can unfortunately create more anxiety. This is why it’s often recommend to spend time focusing on other aspects of your life with the exception of while you are swimming, as well as about 15 to 20 minutes prior to your race. During the time period when you allow yourself to think about your swimming, it’s important to visualize yourself doing well. This will help your brain focus on the proper movements to ensure you perform your best when race time arrives. There’s no shame in leaning on others to help you get through the time prior to your races so you can feel more relaxed. Trust in your coach, your teammates and your family and friends to keep your mind on other things outside of race time and help you find ways to relax so you can approach every race with less anxiety. Today’s society sees a lot of people spending a significant amount of time on their phones, particularly with social media. This should be one of the things you give up close to race time. It can be easy to focus too much on other things, which can shift important brain space away from your performance. If you’re looking for the best performance swimwear to help you swim your best, contact us. We carry everything you need to become a more focused swimmer so you can rest assured you are ready to go when race day arrives. TYR competitive swimwear makes great practice swimsuits. The weather is finally starting to warm up and it’s time to start looking for the ideal spring practice swimsuits. TYR swimsuits are among some of the most popular brands and provide a comfortable fit and all the features you need to swim your best. With all of the options available, swimmers are sure to find the competitive swimwear they want to showcase their sense of style and help them improve their performance. When you consider TYR swimsuits, you are relying on a brand that has made a name for itself in the swimming world. These practice swimsuits are constructed from polyester, a durable material that can lost 20 times longer than swimsuits made from other materials. The Durafast One material is designed for many hours in the pool or on the beach, making it a great option for swimmers practicing for the next big meet. Not only do these swimsuits last longer, but they are designed to provide the level of comfort swimmers need when they are wearing the swimwear for long periods of time. Many swimmers aren’t just concerned with the functionality and comfort of their competitive swimwear. TYR works with their designers to create a variety of fun designs swimmers will love to wear in the pool during practice times. When you’re competing, you will need to wear your selected team swimwear, but when it comes to training, the choice is yours. Being able to choose something more fun for those endless hours in the pool can help you express your sense of style. For instance, the Cutoutfit one piece swimsuit from TYR is available in three fun designs for women, featuring bright colors and designs. TYR is the largest privately held swimwear company in the United States, providing swimmers with a vast array of competitive swimwear options for every use. Swimmers will be able to find fun practice swimsuits to help break up the monotony of training, as well as quality performance suits designed for optimizing performance during meets. Regardless of your reason for choosing TYR swimsuits, you are sure to find one that best suits your needs. If you’re looking for the best competitive swimwear in Dallas, contact us. We carry a variety of styles and colors so you are sure to find just what you’re looking for. Practice swimsuits can be fun. While you may be limited in the color and style of competitive swimwear you must wear, practice swimsuits are another story. Buying a one piece swimsuit of your choosing can make all the difference in feeling great about your time in the water between your meets. When it comes to Dolfin swimwear, you have a vast selection of options from which you can choose. The Dolfin Uglies V-2 Back swimsuit is one of our most popular options and is sure to please for a variety of reasons. One of the reasons the Dolfin Uglies V-2 Back swimsuit is such a popular option among swimmers for practice swimsuits is its classic design. Not only do these swimsuits provide the performance you need, but they also offer greater durability so it doesn’t matter how much you wear them in the pool. This one piece swimsuit is fully lined and provides the coverage you need for a more modest fit. The thin straps and the specially designed V-2 back maintains the support you need, while giving you a more comfortable fit for those long hours practicing in the pool. This design also allows for the greatest range of motion. Practice swimsuits are the one time you are able to really let your personality shine through in your choices. When you swim on a competitive level, you often need to pick a racing suit that is a certain color or style. However, for practices, you are free to wear whatever you would like. With Dolfin swimwear like the Dolfin Uglies V-2 Back swimsuit, you will be able to choose from a number of designs, all colorful and full of personality. These affordable suits will bring a splash of color to the pool and will allow you to show off your personal sense of style. Choosing a one piece swimsuit to wear for practices can be a fun experience for many people. With the Dolfin swimwear line, you will find some of the most fun pieces out of all the competitive swimwear brands. These swimsuits offer the ultimate in comfort and performance, allowing you to train your hardest so you can swim your best when those big races come around. If you’re looking for practice swimsuits that allow you to show off your sense of style, contact us. We carry all the latest styles from some of the biggest names. The best pool fitness gear helps build muscle and endurance. Everyone is aware swimming is an excellent form of exercise. Whether you are swimming competitively or you do it on a recreational basis, you can build your strength and endurance so you can become a more powerful swimmer. With the best pool fitness gear and practice swimsuits you can improve your competitive swimming. With the right combination of diet and exercise, you can build muscle and increase your endurance so you can become a more effective competitive swimmer. While there are plenty of exercises you can do, swimming offers a few unique advantages. Swimming uses resistance to strengthen muscles, but without the stress common with other types of resistance exercises. This type of exercise can also work a larger variety of muscle groups, all at the same time. Swimmers burn through more calories than the average person, which means it’s necessary to consume more, particularly carbohydrates. Protein is another necessity to help repair damaged muscles as you work out. Good fats, such as fish and nuts, are good to maintain body function. In fact, 65 percent of your calories should come from carbs, about 25 percent from protein and 10 to 15 percent from fats. In addition to getting the nutrition you need to encourage muscle growth for strength and endurance, it’s also important to focus on recovery. Swimming is excellent for recovery because it takes place horizontally, which encourages faster recovery. This exercise also increases blood flow, which speeds recovery as well. In general, it is best to allow your muscles to cool down for a period of time after any exercise, including swimming, but this doesn’t mean stopping cold. Instead, you should use light exercise to cool down. Building muscle and increasing your endurance is essential if you plan to become a more effective competitive swimmer. While practice swimsuits and the best pool fitness gear is essential to improve your competitive swimming, the way you exercise in the pool and eat can have a dramatic impact as well. As long as you know how to enhance your recovery, you will find you become a more efficient swimmer. If you’re looking for the best competitive swimwear in Dallas, contact us. We carry all the practice swimsuits and swim gear you need to become a stronger swimmer with greater endurance. Choosing the right practice swimsuits is important. While most competitive swimmers focus on finding the right competitive swimwear for their races, it’s also important to look for the right practice swimsuits as well. These suits will go through more extensive wear than the ones you use during meets. This means they need to be durable and have a similar type of fit so you can work on the specifics of your stroke to match your race time environment. Speedo swim team suits make excellent practice suits to give you the fit and durability you need for more effective training. When you are choosing practice swimsuits, you will find a variety of materials from which you can choose. Lycra is one of the most popular options and has been for a long period of time. This material mixes Spandex with a number of other materials for greater flexibility and durability. These suits typically retain their shape much better over long-term wear than your other options. Polyester and nylon are also common choices. Polyester is often considered for its incredible durability, while nylon is popular for its lightweight nature, giving swimmers even greater freedom of movement as they work on their stroke techniques. In addition to choosing the right material for your practice swimsuits, you need to consider the type of suit you will wear. For many swimmers, it’s important to choose a similar type to your competitive swimwear. If you want something with a little more coverage, the traditional type of suit will give you the desired results. However, many competitive swimmers also enjoy the look and feel of minimalist swim suits because they allow for slightly more range of motion so you can focus on the movements of your limbs without concern chafing or other problems with rubbing. Practice swimsuits don’t have to be anything special as long as they are something you feel comfortable in. However, due to the excessive amount of time you will probably wear these suits versus your competitive swimwear, it’s important to make sure you have one that will last. 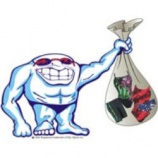 At D and J Sports in Dallas, you will find all of the swimwear you need to train and compete at your best. Are you looking for new practice swimsuits or competitive swimwear in Dallas? Contact us. D and J Sports offers a vast selection of swimwear for all needs.